Join historian and Senior Planner for Downtown Vancouver, Michael Gordon and Vancouver Heritage Commission member, Anthony Norfolk in an exploration of one of Vancouver’s most famous streets – Granville Street, south of West Georgia Street. On Wednesday, May 15, 1886, Lauchlan Hamilton, a City of Vancouver Aldermen and the CPR Land Commissioner began to stake out and survey what would become Granville Street. 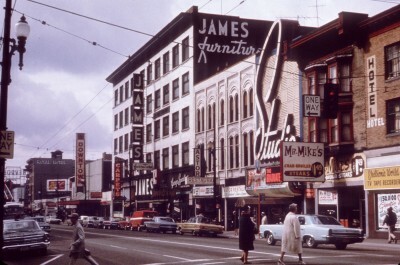 It is still today one of Vancouver’s pre-eminent ‘high streets’ reflecting many elements that define our city. Our walk will begin at the entrance to the Granville/City Centre Canada Line station at the southwest corner of West Georgia and Granville Streets at 11 am. 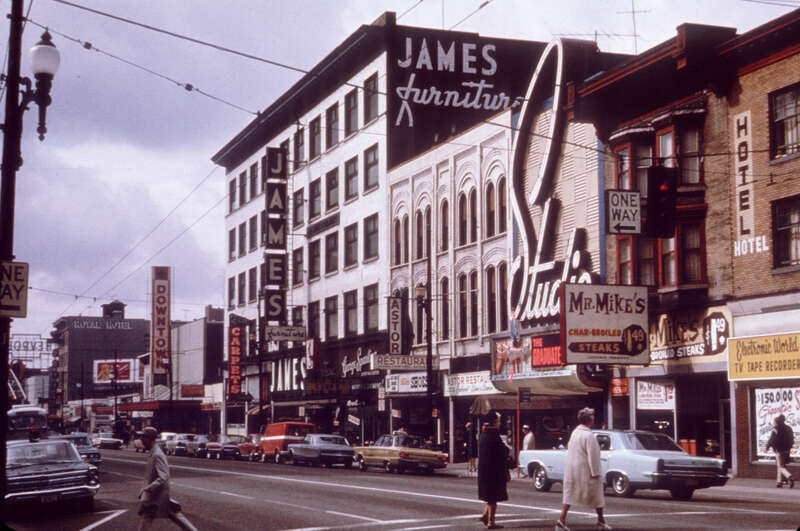 We will then walk south on Granville Street and look and hear about the street’s history with the walk ending at Pacific and Howe Streets, close to where the first two Granville Bridges connected to Granville. Important historic Granville Street buildings and key events that occurred on the street will be discussed. The past and current roles of the street as a transit hub, a shopping street, an office, hotel and entertainment district and a cultural and neon mecca will also be highlighted. Granville Street’s heritage buildings are primarily from the 1909 – 1915 building boom, with some notable examples of buildings built between 1929 and the 1940’s. Their architectural details and historic significance will be discussed. It will also be noted that a key Council decision in the early 90’s reduced the permitted height from 300 feet to 90’ on the blocks south of Robson Street resulting in the retention of almost all of the historic buildings that existed on these southerly blocks at that time. More recent initiatives aimed at the revitalizing the street and the transformation of the blocks south of Drake Street will be discussed.